I love it when Mr Seasons and I have the time to cook up a storm together. Just before Christmas we visited the new fish markets in Drummoyne and came home with a whole snapper. My copy of the Sydney Seafood School Cookbook came to the rescue in how to prepare it and cook it. "For more than 20 years, Sydney Seafood School has been teaching us how to prepare and cook the wonderful array of seafood found in our oceans and rivers. Now, for the first time, the School shares its wealth of tips and techniques, along with more than 80 outstanding recipes from Australia's leading chefs. There's also expert advice on choosing and storing seafood, plus step-by-step photos of essential techniques, including filleting and butterflying fish, shucking oysters, cleaning squid and octopus, and preparing crabs, prawns, and bugs. 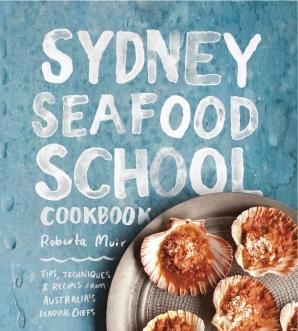 With beautiful photos of all the recipes to help you decide what to make, and illustrations of the various species so you know what to look for at the fishmonger, Sydney Seafood School Cookbook will give you the know-how and confidence to prepare seafood at home—with delicious results every time." It was so yummy scrummy I forgot to take a photo of the finish product - we were too busy eating it! However the picture in the book above was pretty close to our first effort. The whole baked snapper was so tasty and so easy, I can't wait to try out more of these recipes - watch this space! That does sound wonderful. We live in Florida and love the fresh seafood available, snapper is a bit of a luxury for us. My family loves snapper, they would love this. That sounds fantastic. I wish we lived where we could get more fresh seafood.